Mizoram girl Juchy, winner of K-POP India is one of 72 global contestants in 2018 to take the stage. First Prize Winner of the vocal category in Changwon K-POP India 2018. 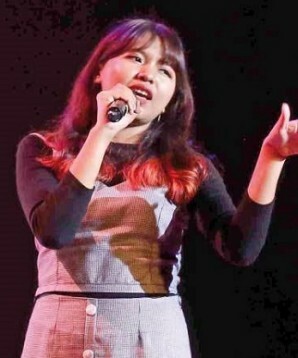 On 9th of July 2018, a young girl Juchy from Mizoram made headlines when she won the First Prize in the vocal category at the grand finale of The Changwon K-POP India 2018. Juchy was overwhelmed and emotional and said: “This one I so badly needed and it's such a thrilling moment.” Juchy will represent India at the prestigious K-POP World Festival to be held in October 2018 in South Korea. The K-POP event took place at the Siri Fort Auditorium in South Delhi. The Changwon K-POP India 2018 had packed crowds of youngsters who were screaming and shouting in excitement. The desperate frenzy fans were trying to barge in and eventually the organizers had to oblige them despite running short of seating space. This is the level of enthusiasm the K-POP competition is creating over the years. To cheer their homegirl Juchy, many had come from Mizoram and there were quite a number of Delhi Mizo crowd. Juchy being a debutant, seemed a bit nervous when she saw the packed crowd and the Judges line up. The moment she took the Mic, out came her mesmerising voice with an electrifying performance. The judges were edgy on their seats and the audience went into raptures. She performed like a seasoned star. The judges also included The Bangtan Boys, popularly known as BTS and the members of Snuper, a K-Pop boy band. The Judges were surprised to see many participants sing Korean songs with perfect accents. Juchy will represent India at the prestigious K-POP World Festival in South Korea to be held in October 2018. Indians have already made their presence felt in 2016 when Priyanka Mazumdar won the third prize in the vocal category. has earnestly begun her preparations for the Mega event in October 2018. Admits that she has to work really really hard and is caring enough for her vocal hygiene. With the god given gift and sincerity, she sure stands a place at the World Competitions. Juchy has been singing ever since she was a child. Winning many a prize at the school and college levels she trained her voice with one of the local music schools and has spent a lot of time on watching videos and learning. Juchy is part of the choir and a band in Mizoram. Her parents too have been very supportive right from the start. Music runs in her veins and for that matter, everyone in the northeast is gifted musicians. It is Korean Pop abbreviated as K-POP and is a modern form of South Korean Pop influenced by styles and genres from around the world such as Latin, gospel, jazz, reggae, country or classical. It experienced a slump in the 80s and a more modern genre emerged with the K Pop groups Seo Taiji and Boys in the 90s. The K-POP culture actually took shape in 1996 and by the early 2000 spread like wildfire. Which teen or adult isn’t crazy about Korean dramas, films, TV shows and films? The fanbase is enormously getting more popular each day and somehow youngsters relate to the culture so well. Gauging the popularity, the Korean Cultural Centres introduced K-POP World Wide. Its a unique festival organized by South Korea’s Ministry of Foreign Affairs and Korean Broadcasting System (KBS) – Its an event of various categories under Music and Dance. The worldwide K-POP will have representatives from 72 countries this year. The first Indian K-POP was introduced in 2012 and the response received in just six years is overwhelming said Kim Kum Pyoung, Director of Korean Cultural Centre. This year in India, saw more than 1250 registrations and over 700 participants from 10 cities at Siri Fort aged from 16 to 25 years. It was attended by the South Korean President Moon Jae-in and the First Lady Kim Jung.